There’s many reasons why racing horses with Australian Thoroughbred Bloodstock can be so rewarding, one of the main ones is, they always have their owner’s best interests at heart. Take the classy debut win of Tintaglia at Ararat last Monday. Darren Dance of ATB liked the horse at the sales and bought her cheaply, with the intention of syndicating her further down the track. As fate would have it, that would be happening sooner rather than later. Unfortunately for all concerned, a filly that we had shares in with ATB was unable to stand up to the rigours of racing and the decision was made to move her on. A bad experience for any owner is not something that sits well with Darren Dance, but that’s the nature of the beast when syndicating racehorses, not every horse is going to be a Platelet or a Taiyoo. After the dust of disappoinment had settled, Darren contacted the owners to let us know he was as disappointed as we were that the horse wouldn’t make it to the track. He then said that he had a filly back home at Manningtree Park that might be a nice replacement for our horse if we were interested. A free replacement, who does that? ATB does, when they feel their owners have had a less than satisfactory experience. The replacement horse was a 3yo filly by Hidden Dragon from Phi Graceley and for us personally, we were undecided on whether to continue in this horse or to bow out gracefully and cut our losses. Another reason we like racing horses with ATB is that Darren Dance rarely lets you make the wrong choice when he knows a horse has ability and is likely to bring you great joy when it finally makes it to the races. So with a little Dance persuasion we made the decision to get in the filly, along with many of the same owners from the moved on horse. We decided to split up our share to rope in three long-time friends who had always wanted to get involved in racehorse ownership but had never taken the punt. This gave them the chance to get involved cheaply as first-time owners and it gave us a chance to race this filly together to be able to enjoy the good times that owning a racehorse has to offer. The filly’s name was Tintaglia, and after a patient learning preparation with the all-conquering Darren Weir stable, she finally made it to the track earlier this week at Ararat. She had plenty of owners on hand to see her first race start, including one of our long-time friends, who we hadn’t seen this excited since Holden last won Bathurst, which was a while ago. For ours, we would have been happy for Tintaglia to hit the line nicely and finish within a couple of lengths of the winner, but horse and jockey had other ideas. Tintaglia would be perfectly ridden by Dean Yendall, country racing’s premier jockey, and combined with the magical Weir touch, she would cruise up to the leaders in the straight and go on to win stylishly, as if she had done it all before. The unbridled joy on the faces of the new first-time owners as Tintaglia crossed the line was something to behold. The high fives, the hand shaking, the delerious excitement of winning owners who have witnessed their horse greet the judge first. You can’t beat it! The added bonus of winning money on the punt, along with the other added bonus of winning prizemoney for coming first, just sweetened the moment. But you’re not in racing to make money, you’re in it to win races with family and friends and fellow owners, to share in a moment that will live with you all forever. If you make money along the way then you take it. Not many horses make it to the races and win, many things can go wrong along the way, then when everything goes right, they may simply be not good enough. The horse we were initially involved in was not good enough, but the horse Darren Dance and Australian Thoroughbred Bloodstock replaced it with, Tintaglia, was good enough. As owners, we are very grateful to the generosity of ATB for turning disappointment into excitement, by offering us the chance to replace our initial horse with an exciting prospect in Tintaglia. For us personally, this is the second time Darren has replaced a non-performing horse with another horse, and both times they have won. Testament to the way ATB do business and look after their owners. Tintaglia is likely heading to town for her second start and fair chance there will be three of our long-time friends on hand to see her race, along with another great bunch of fellow owners. Get involved in racehorse ownership, in our opinion, nobody does it better than ATB! 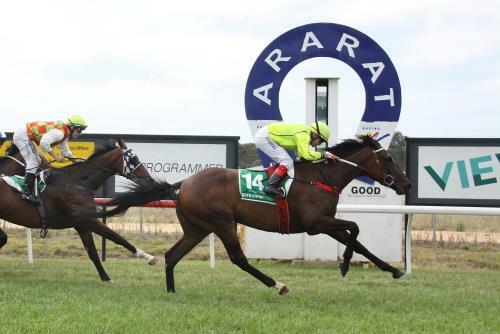 Tintaglia, ridden by Dean Yendall and trained by Darren Weir, wins on debut at Ararat on Monday 23rd February 2015 from Dicalest (2nd) and The Assayer (3rd).